The new World Trade Center transportation hub is being built underground, requiring extraordinary surveying for the massive project that will dwarf Grand Central Station. 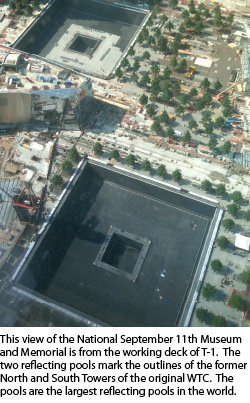 When Professional Surveyor Magazine visited the World Trade Center (WTC) construction project rising in downtown Manhattan for our July 2010 cover story, we focused on the innovative surveying work of the high-profile building structures. Every bit as challenging, if not more so, is the work underway on the massive underground WTC transportation hub. When completed in 2014, the $1 billion transportation hub at the corner of Church and Vesey streets will be immense. Its main entrance hall alone will be so massive that all of mid-town Manhattan’s legendary Grand Central Station would fit inside, with room to spare. Click here to visit our homepage for an animated fly-through video of the future transit concourse and more 9/11 links. The hub will form an underground connection between the World Financial Center. Through it, more than 200,000 daily commuters and millions of annual visitors will have access to the Hudson River ferry terminals, Port Authority Trans-Hudson (PATH) trains, 14 subway lines, and, potentially, a direct rail link to JFK International Airport. Recently, we discussed the project with Scott Zelenak, chief of surveys at the World Trade Center for the Port Authority of New York and New Jersey. Zelenak is well versed in the challenges of the WTC effort. A Union surveyor with Local 15D, he has worked in surveying for nearly 35 years, the last 20 as in-house consultant to the Port Authority. He works for Layout, Inc. and has been chief of surveys at the WTC for the past 10 years, participating in the rebuilding of the WTC after the 1993 bombing underneath the north tower. “Both below and above grade, this is the single most intense and intricate design I have ever seen,” Zelenak told us. 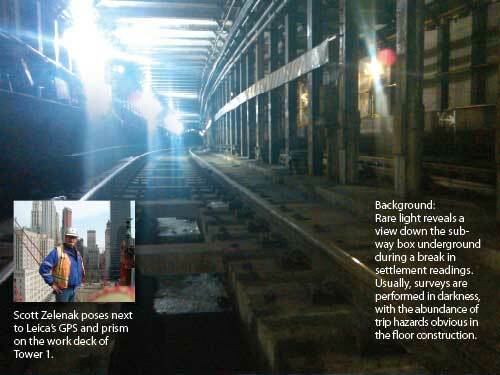 The first construction package of the transportation project, begun in early 2006, is the underpinning of New York City Transit’s number one train subway box that runs through the center of the site in a north-south direction. The project involved the installation of more than 450 mini-piles and jet grout cut-off walls to support the subway box while excavations are conducted below the box. Zelenak said a major portion of the work involves monitoring tunnel and wall deformation during construction. “There are two components to the subgrade monitoring,” he explained. “Automatic instrumentation [AI] and optical surveys. The AI incorporates tilt sensors, inclinometers, water level gauges, and automatic total stations reporting by email. Generally, they work fine as a system. However, power interruptions, interpretation, and ‘gremlins’ have affected the results. “Every piece of steel is curved in plan and profile, and the tolerances for fabrication and erection are infinitesimal,” Zelenak said. “Were it not for the modern instruments and software we use, it could not be built. “For example, 3,000 tons of permanent steel has already been installed. The main ‘spine’ above the station, known as a Vierendeel truss, consists of 50 pieces and weighs 270 tons. The Vierendeel ties together hundreds of ‘arches’ that are individually designed, arrive in slices, and are field-welded to form soaring waves. “The biggest issue has been how to survey steel curved in three dimensions, which is placed with a three-dimensional pre-camber. The solutions arrived at between the steel surveyors responsible for erection and the Port Authority surveyors responsible for checking have been unique and innovative. “There will be those who say that is impossible, but the techniques, equipment, and experience of the crews have provided results which meet rigorous mathematical vetting. With all the unique challenges of this project, it is proceeding on schedule. The Port Authority of New York and New Jersey’s prime contractor for this immense job is Phoenix Constructors JV, a joint venture consisting of Fluor, Slattery Skanska, Bovis Lend Lease, and Granite Construction. The Port Authority Central Survey Group provided the initial control, updates, and additions to the control and design mapping, and it maintained a series of as-builts and checks during construction. Phoenix Joint Venture and Skanska provided the footings, foundations, and platforms, and DCM erected the steel in the station itself. In the East Foundation area (the main entrance hall), Phoenix JV and Tutor Perrini provided the excavation, EIC the foundations, and Sorbara the sheer walls and concrete columns and slabs. Neil is publisher of the magazine.